In Robert Zemeckis’ “The Walk,” the depiction of the historic 1974 high-wire crossing between the World Trade Center towers, the biggest danger Philippe Petit must face is not the treacherous gusts of wind in lower Manhattan. It’s not the possible mathematical miscalculations over the tension of the high wire. It’s not even the distraction created by the SWAT team-like response of the New York City Police Department. No. The biggest demon the flamboyant Frenchman has to slay is self doubt. No one around him is allowed to say the word “death.” No one is permitted to speculate on him failing. Every conscious thought must be devoted to succeeding. For many of us, presenting in front of a room full of people can feel like the ultimate high-wire act: one wrong move or any slight loss of concentration can spell doom. So as important as thorough preparation and conscientious rehearsal are, one of the most important strategies behind effective public speaking is something that is seldom stressed: the removal of self doubt. Think of it as The Petit Principle. Unless you’re one of the lucky few who get a genuine endorphin rush from public speaking, exhibiting an unshakable self confidence may be a fake-it-till-you-can-make-it proposition. The trick to faking it rests in knocking that evil voice of self doubt off your shoulder. Here are some tips on how to do that, and please whatever you do, do NOT imagine your audience in their underwear. Talk about unnecessary distraction! Your Content Rocks: When presenting, you must display a palpable enthusiasm for the value of the information you’re sharing. The audience is taking their cue from you. If you seem a bit bored and unsure of your material, your audience sure isn’t going to get pumped up. Many times I’ve seen skilled presenters take mediocre content and get a good response simply because they smiled and put their back into it. Find Friendly Faces: A real confidence killer is looking out into your audience and seeing looks of sheer boredom. That doesn’t mean your audience is really bored. All it means is that they’re not aware that they’re sporting a bitchy resting face. Many times after one of my own presentations, I’ve had the most bored-looking audience member come up and tell me how interesting they found the content. So while it’s important to read the room, don’t fall victim to over-reading it and think the worst. Better yet, find four people in your audience, one in each quadrant of the room, who are smiling and nodding and boosting your confidence and speak mostly to those four people. Paranoia Will Destroy Ya’: It’s not uncommon to stand in front of a room and trick yourself into thinking that the audience is just sitting back and waiting for you to have a meltdown. Do yourself a favor and shelve the suspicion of schadenfreude. Unless you work in a company with a take-no-prisoners culture, nobody is actively rooting against you. Your audience wants you to succeed. The last thing they want to witness is an oratory catastrophe. Be Zen: Effective public speaking is all about being in the moment. Your total concentration should be on the line you’re delivering and where you’re going next. If you make a mistake, don’t begin post-analyzing what went wrong five seconds ago. If you do that, your mind and your mouth will fall out of sync and you’ll be much more likely to make additional errors. Also, don’t worry about a challenging section of your presentation that’s still minutes away. That can also make you lose focus. 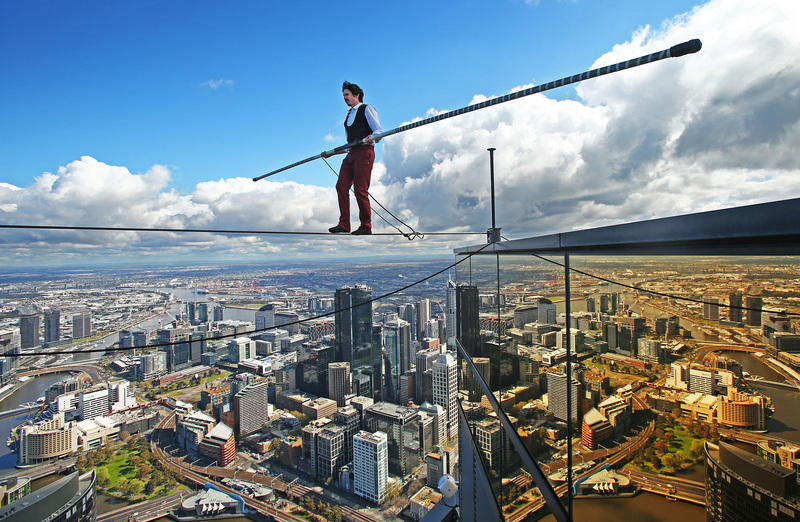 Philippe Petit claimed that when all was going right on the wire, he would feel a sense of inner peace and tranquility. We may never get to that elevated state when it comes to our public speaking. But envisioning success, removing self doubt and diligently working to get total buy-in from your audience by being upbeat and enthusiastic is a pretty good recipe for success.